This metal return air grille is your solution to heating and cooling your space while allowing the air to flow back down to your furnace! Our triangular baseboard vent has no adjustable louver so the air is constantly being returned into your home heating/cooling system. Installing the metal return air grille is a snap, just mount the base with any drywall screws. 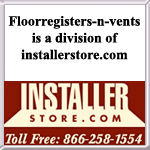 Another great baseboard vent feature is the detachable faceplate which makes cleaning inside the vent simple and easy! Our 4 foot metal return air grille is a rare find since this size is not common in stores. The triangular baseboard vent is finished in a classic white enamel to match any room in your house. The enamel finish on the metal return air grille helps to protect the faceplate from tarnishing. Also, this baseboard vent is made out of all steel to ensure its durability. Height of triangular grills is 4 1/2"
Opening in bottom of return is 24"
For more baseboard vent options, check out our triangular baseboard section which features both registers and return air vents. 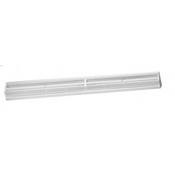 Replace your worn out metal return air grilles today with this classically designed, white triangular vent!